In a post-apocalyptic desert landscape, a fighter named Amp (Cook) has to fight and, well...fight some more. Teaming up with a woman named Wild (Khan), Amp realizes he can put his pugilistic skills to use in Punchfighting tournaments in order to win some water (which is as good as currency in our coming future). The diabolical arch-baddie of the future is a man named Mainframe (Douglas). Once Amp fights his way through all the contenders, Mainframe is the final nemesis, and Amp has special reasons for wanting to defeat him - he was imprisoned, beaten and even crucified by him and his goons. The miniboss is played by Don Nakaya Neilsen. Will Amp and Wild reign supreme? Much like Blood Ring (1991), Fist of Steel is a Davian International production, released by AIP, directed by Teddy Page, and starring Dale “Apollo” Cook. They had quite a thing going for a while. 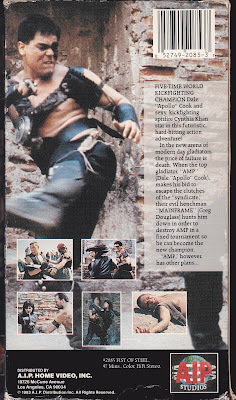 Unlike Blood Ring, this is set in a sparse desert environment, and perhaps could have been titled Desert Kickboxer. It even has enough “sand-fighting” to compete with The Ultimate Game (2001). Of course, Fist of Steel is filled with ‘facepalm’ dialogue, brain-cell-depleting pretexts for fights, and very silly costumes. As we all recognize, whoever survives after the bomb drops will be wearing hubcaps and broken smoke detectors on their chests. But isn’t that why we watch these movies in the first place? Would we expect anything less? Sure, what we’re watching, technically speaking, is “dumb”, but we all knew that going in, and it all contributed to making the video store era great. Speaking of dumb, Dale “Apollo” Cook may not be a master thespian, but he does a great “dumb face”. If something dumb is going on, you can count on an authentic reaction from Cook. We kid because we love. We’ve seen every available Cook movie and we remain fans. His Martial Arts abilities are why we’re here, after all. It was a genius move to pair him with Cynthia Khan, who fans of Hong Kong action will know. Her presence is vital to the movie and keeps things rolling along. The same could be said for fan favorite Nick Nicholson, who plays a druggie fight promoter. He wears a silver shower cap and matching shorts. He got a respectable amount of screen time, which is a good thing, and we’re guessing the film was shot in the Philippines, because his fellow stock company - Cris Aguilar, Ned Hourani, and Mike Monty also make brief appearances. While there is a ton of Punchfighting on display, use of nunchuks is also prominent. It’s likely that if this ever got a UK VHS or DVD release (we don’t think it has, but correct us if we’re wrong), it would be cut there, because they hate nunchuks. They even hate nunchuks if they’re made out of sausage links, as the BBFC proved when they cut Teenage Mutant Ninja Turtles. All that being said, there is some dialogue too, as previously alluded to, but why talk when you can grunt? That seems to be the overriding ethos. Hence, there are plenty of unintentional ‘laffs’. Like if someone says something to Apollo, and his response is “UUUUuuurrrggghhhhh!! !”, it’s hard not to respond to that with some chuckles. Fist of Steel is one of the more watchable post-apocalyptic movies we’ve reviewed, thanks mainly to the cast and the non-stop beat-em-ups. If that appeals to you, do seek it out.